Get a head start on your design using one the resizable templates in AlphaCorr packaging or point-of-sale display design library. 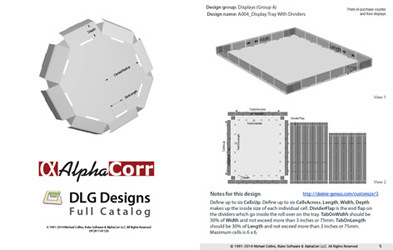 Below are PDF files of the catalog listing and the full catalog pages for AlphaCorr’s parametric design library. These designs are included with all AlphaCorr products including Rules™, SteelRules™ and Dieline Genius™. Dieline Genius license options include versions for Desktop, AI Plug-in or Online for a little as US $2.00 per design.